Small accordion book with a collection of computer haiku that have circulated the Internet. I enjoyed the dichotomy of using handmade materials to hand-letter a book about the cyber-technical world. Gouache text lettering with pens and brushes on Twinrocker's handmade Yale paper. Hard covers are covered in Australian marble-printed papers. 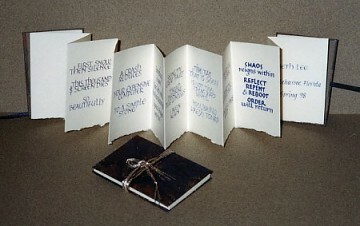 Book 2″ x 2¾″ (5cm x 7cm). See her artist book in Pauline Sager's Scroll Swap.